KITT PEAK, Ariz. - This week, I spent my first night under the stars at Kitt Peak in southern Arizona, where I'm following a group of astronomers and their students on an observing trip. I'm a skywatching neophyte and a worse photographer, but I braved 20 mph winds (and my own jetlag) to set up a tripod outside to try to capture some bright spots of the sky. No matter how many times I see a moonrise it always surprises me. I didn't get any good pictures of the moon itself, but it provided a nice backlight for the suite of observatories perched at the top of Kitt Peak. 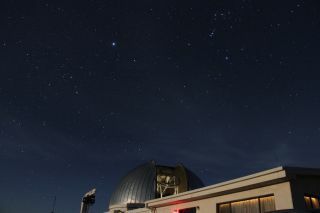 Kitt Peak National Observatory and the night sky as seen on the night of March 17, 2014 by Space.com's Megan Gannon at Kitt Peak, Arizona. After the sun set last night, a familiar parade of bright stars and planets arrived in the sky. Jupiter popped out of the twilight first, then Sirius (the brightest star in the night sky), then Betelgeuse and Rigel and the other members of Orion. The spectacle often stops there in New York, but I soon found it difficult to keep track of all the newly emerging lights. I don't think I'd mind switching to a nocturnal schedule here (that is, if it weren't also 75 degrees F and sunny with clear views across hundreds of miles of rugged terrain during the day).